Some things don’t change much over time. Trees. Mountains. Crossword Puzzles. Whether 2013 or 1913. You can count on them to not change a whole lot. Right fielders, as you can see, don’t change a whole lot either. This photograph would have been a throwaway. Except I took it in black and white, because, I don’t know, I was just messing around. And, Tony Butler, a University of Virginia freshman, became timeless. Sunday, October 6, 2013. Davenport Field, University of Virginia. Intrasquad game. 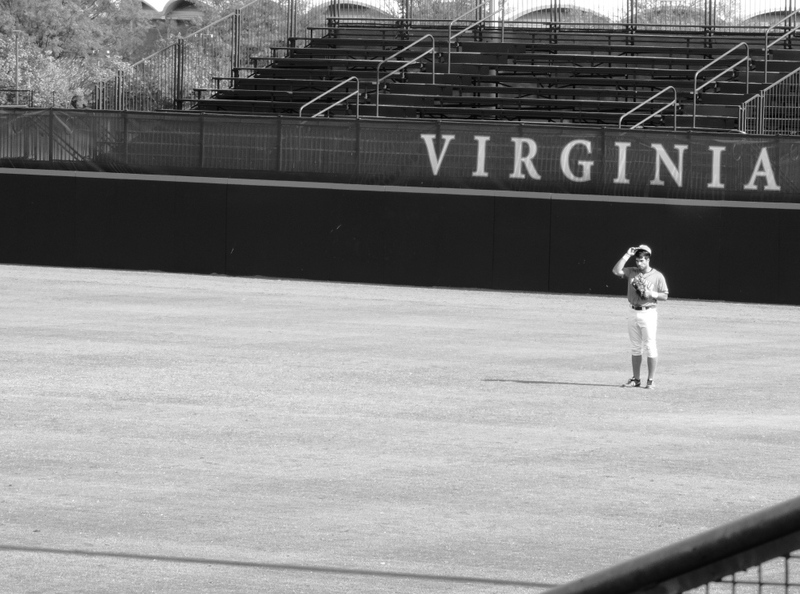 This entry was posted in Baseball, Life, University of Virginia and tagged Davenport Field, photography by Jackie, The Baseball Bloggess. Bookmark the permalink. You’ll have plenty of time to reminisce while your adopted A’s are at home licking their wounds. I hate to say it out loud, but baseball is starting to aggravate me. I couldn’t do it. I tried, but I just felt so dirty. I’m an Oriole girl. Rooting for other teams … I try, but at the end of the day, I just need to take an extra shower. But, your Cardinals are birds … so ornithologically speaking anyway, I can wish you well! You should probably shower every day even if you aren’t rooting for strange teams. I’ll take your well wishes, ornithological or otherwise. Excellent advice. The A’s and Red Sox, especially, could do with a little extra soap’n’water (and maybe a flea dip for the beards). I have to admire the Red Sox beard. I look forward to the confusion that will ensue when they invite ZZTop to sing the national anthem. As a proud member of the beard-wearing fraternity though, I must point out that regular shampooing (as I trust they do while showering after games) will eliminate the need to invest in flea dip. Oh, yes, no offense to you at all, Casey! Well-tended facial hair can be quite fetching! Not so sure about Mike Napoli though. And, Clay Buchholz claims that he “bathes” his head in bottled water between innings, so no that’s not anything slick in there to juice up the baseball, it’s just that his hair is wet. Uh, ok.
No offense taken. I’m well aware that not every beard proprietor takes proper care of his facial accessory. As for Clay, well, can’t blame him for trying to find an edge, and it’s nice to know someone is trying to keep the old baseball traditions alive. He might want to have a chat with Gaylord Perry about the value of water as opposed to other substances, though. Some things should never change, but some things simply must. Your blog falls into the former category, as does the “beard vs. clean shaven” discussion. Each of us has our own list of items that belong in the latter category. Hey There – I just read a few of your recent blogs. I love your blog!!! I’ve been away from blogging for a few months – my fall gets work ugly. Not ugly so much as insanely busy, but it’s coming to an end. After the last game – my Facebook status read: “Just a mere 136 days before pitchers and catchers return to Spring Training.” I’m a total O’s junkie!! Anyway – I love the pic here, and I enjoyed several of your recent posts!! I’ll try to be more fateful in my reading . . and writing. And, lots more photos coming … I’m finally getting the hang of this fancy camera gizmo! Do you ever read the MASN Blogs? We have quite a neat community on School of Roch. Lots of crazy O’s fans to keep you company. I’m sure you can find it with Google. I’d LOVE to read you on there as well. I think you would really enjoy the community . . .well most days. And I know folks would enjoy you. Warning – it can get addictive. Yes, I do drop in to MASN blogs … I love reading Roch and Steve and Brittany! All the commenting gets a bit too noisy for me sometimes … so I usually just take a look, but rarely comment. I thought Darren O’Day’s vid-interview with Steve M. last month was wonderful. Love those boys in the ‘Pen! I miss “Giant” baseball! I loved your post on 9/30. I do feel like I’ve been invited somewhere I don’t want to go. Plus I thought well…maybe the Pirates, uh, nope. So I start to wonder if I’m some sort of jinx. So we all know I’m not watching the Cards! Just wanted to drop you a line and say thanks for your posts. Hope all turns out well for your recovering Orioles. And, on a Giant note, I’m so glad that the team wrapped up the deal with Hunter Pence … he’s a key part of Giant spirit!